- Cornflower 1: Slip 4 with yarn in back (wyib), drop first elongated st off needle to front of work, sl the same 4 sts back to left-hand needle, pick up dropped st knitwise and sl it onto left-hand needle; then k2tog tbl (the elongated st and the next st), k3, sl 3 wyib dropping extra wraps, drop last elongated st off needle to front, sl 4 wyib, pick up dropped st onto left-hand needle, sl the same 4 sts back to left-hand needle, k3, k2tog. - Cornflower 2: Sl 3 wyib, drop next elongated st off needle to front of work, sl the same 3 sts back to left-hand needle, pick up dropped st knitwise and sl it onto left-hand needle; then k2tog tbl, k2, sl 1 wyib, drop next elongated st off needle to front, sl 3 wyib, pick up dropped st onto left-hand needle, sl the same 3 sts back to left-hand needle, k2, k2tog. Cast on a multiple of 18 sts +2. Row 1: K5, * (k1, yo, k1, yo, k1) in next st, k17; repeat from * to last 15 sts, (k1, yo, k1, yo, k1) in next st, k14. Row 2: P14, * p5 wrapping yarn twice for each st, p17; repeat from * to last 10 sts, p5 wrapping yarn twice for each st, p5. Row 3: K1, * Cornflower 1, k9; repeat from * to last st, k1. Row 4: P14, * sl 3 wyif, p17; repeat from * to last 8 sts, sl3 wyif, p5. Row 5: K2, * Cornflower 2, k11; repeat from * to end. Row 7: K14, * (k1, yo, k1, yo, k1) in next st, k17; repeat from * to last 6 sts, (k1, yo, k1, yo, k1) in next st, k5. Row 8: P5, * p5 wrapping yarn twice for each st, p17; repeat from * to last 19 sts, p5 wrapping yarn twice for each st, p14. Row 9: K10, * Cornflower 1, k9; repeat from * to last st, k1. Row 10: P5,* sl 3 wyif, p17; repeat from * to last 17 sts, sl 3 wyif, p14. Row 11: K11, * Cornflower 2, k11; repet from * to last 2 sts, k2. In the video, cast on 13 sts. 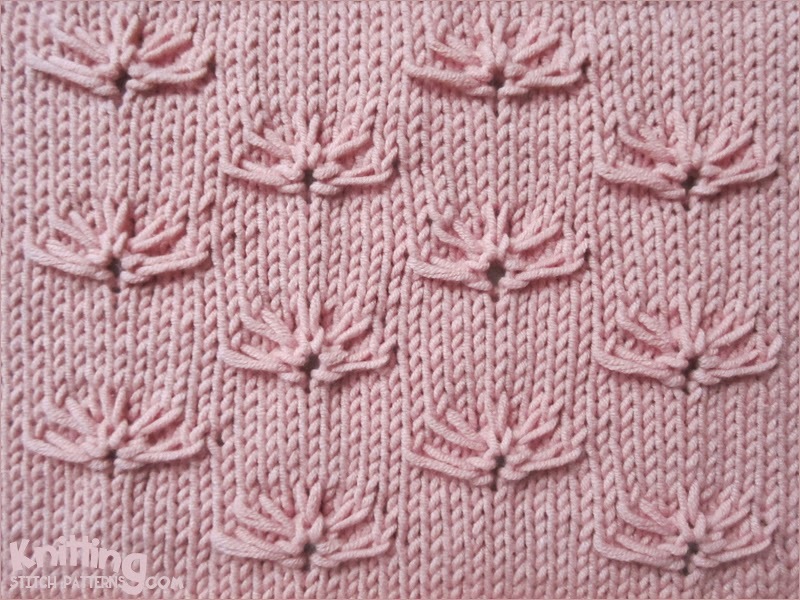 It is more like a quick-start guide that will help you how to knit this stitch. Row 3: K6, (k1, yo, k1, yo, k1) all in next st, k6. Row 4: P6, p5 wrapping yarn twice for each st, p6. Row 5: K2, Cornflower 1, k2. Row 6: P5, sl 3 wyif, p5. Row 7: K3, Cornflower 2, k3.